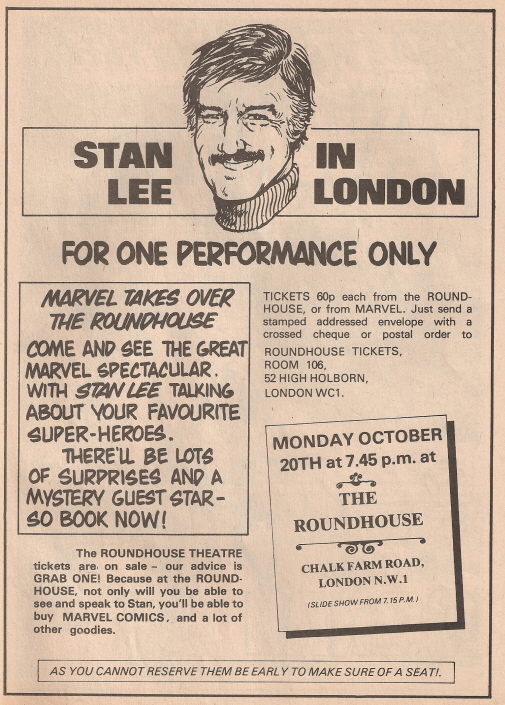 In getting rid of all the stuff I’ve accumulated over the years, I came across this advert a couple of days ago in a British Planet Of The Apes weekly comic from 1975 – Stan Lee, live at the Camden Roundhouse. He presented a slide-show, with tickets priced at 60p. I absolutely would love to see Stan Lee – I think as a writer, he’s one of the greats of the twentieth century. So many household names flowed out of his head in such a short span of time (about four years in the mid-60s, many of them in collaboration with the artists Jacky Kirby and Steve Ditko) – Spiderman, The Hulk, Thor, The X-Men, Iron Man, The Fantastic Four, Doctor Octopus (surely one of the greatest villain names ever? ), Dr Doom, The Avengers, Daredevil, Dr Strange; the list just goes on and on. It was about this time that the first comic shops started opening in London (one of the very first was Dark They Were And Golden Eyed, which moved around Soho throughout the seventies), but it’s sad to see how many of them have closed in the last decade. It’s a combination of the industry destroying itself in the 1990s by pandering to speculators and taking their eye off of stories, the growth of a few professionally-run shops (the Forbidden Planet was always number one by a long chalk, even when it was in a dusty, wooden-floored Denmark Street shop), and the fact that kids these days have more exciting things to do that open comics. They can play Fallout 3 for God’s sake, and given the choice between reading or killing mutant dogs, who can blame them? I think Stan Lee might be the one single author whose work I’ve spent the longest time reading, and have enjoyed the most. He seems like a completely untortured, friendly, unpretentious genius, and he’s had more of an effect on global culture than pretty much anyone else in the last fifty years, and what’s more, in an entirely positive way. I’d happily pay a lot more than 60p to see him do a slide show today. Hey, I’d pay more than 60p just to have him shout a trademark ‘Excelsior!’ right into my face. Thanks for digging this image out. I was there at the Roundhouse on that night. I was just 9 years old and my Grandfather took me as a treat. I remember it as quite an intimate night and unless my brain is playing tricks I remember he sat on a round stage in the centre. (The place seemed much smaller than the Roundhouse seems now.) I don’t recall exactly what he said – answered questions about origins I think – but I do remember his cheery disposition. I was also there, a great night and the mystery guest was spider-man who handed out marvel branded vitamin sweets. Herb Trimpe was there as well. I memory serves Right, Stan was promoting Son of origins, his book telling the story behind the origins of some of his/marvels characters. I managed to chat to Stan and Herb both very enthusiastic about comics, also got thier autographs. Thanks for some more detail ‘A’. I think I do remember the vitamins being given out now you mention it. Also at the roundhouse on Stan Lee’s night was a rock band before Stan came on f memory serves right. Can’t remember much about them, but I like to think it was Icarus, of The Marvel World Of Icarus, but it may have been a couple of years too early. Dark They Were And Golden Eyed & the Forbidden Planet (the original one) were my favorite shops, as a comic fan and collector these shops were really the only places to go. Both moved into bigger premises, Dark They Were And Golden Eyed went to St Ann’s Court or was it ‘Anne’s’ can’t recall. Sometimes my Mum would go there with me for a trip into London, she would sit on the round staircase and read a comic while I got my monthly fix of graphic fiction. I remember about this and would love to have gone,but I have to say when I heard about the event later,I’m glad I didn’t.The Marvelites there hissed when Stan Lee happened to mention DC comics.I was a big fan of Marvel myself back then,but think this behaviour was immature and thoughtless.Lee must have been embarassed. It was wondered about at the time,if this really was Marvel’s mature and intelligent readership.I wonder too.